Whenever your Xbox 360 updates to the latest edition of the console’s dashboard software (Microsoft started a gradual roll-out of the update last week), you may initially be impressed by the new color scheme, or the dashboard’s clean aesthetic. Sadly, when you attempt to use Twitter to tell your friends all about it from the comfort of your couch, you may be dismayed to find that the world’s most famous micro-blogging site is nowhere to be found. Alarmed, you’ll immediately start digging through features on the new dashboard in a mad rush to warn your Facebook friends of the apparent Twitter-napping, but will be stymied there yet again. Microsoft, it seems, has removed both applications from its flagship console, and would instead prefer that users access their various social networking sites by using the Xbox 360’s Internet Explorer web browser. Before you obsessive Twitter users freak out, there are a few points you should know. 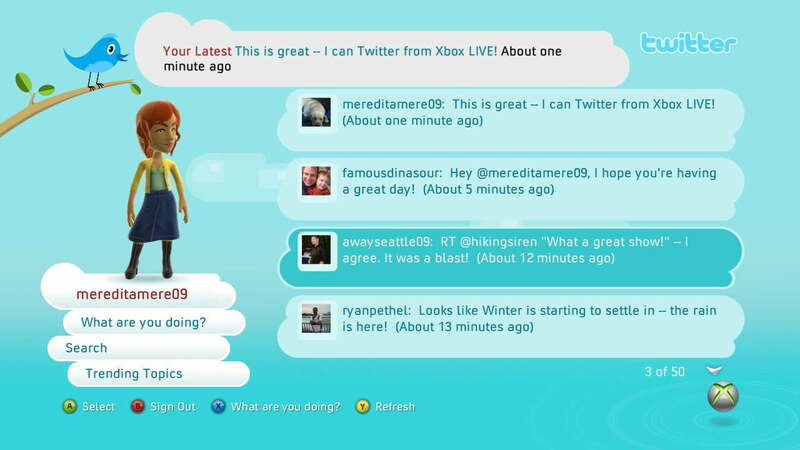 First, if you already have the Twitter or Facebook applications stored on your Xbox 360, the new dashboard will continue to display them in your list of software just as the old dashboard did (at least as long as you don’t delete them). Second, as Neowin points out, the added functionality of this new dashboard means that you can take those existing programs and pin them directly to your home page for easy access. Again, this is assuming you never, ever delete them. If you do delete them however, there seems to be no way to get them back. Though both Twitter and Facebook remain on the Xbox 360’s list of content partners, neither application can be found or downloaded within the new Xbox 360 dashboard. While a loss of functionality is always terrible, this particular situation raises more questions than anger within us. Quick survey: How many of you ever used either the Twitter or Facebook applications for any extended period of time? We’ve fired them up to check out their functionality, and occasionally out of boredom, but we don’t think we’ve ever met anyone who conducted a large segment of their social networking via Xbox 360 (or any gaming machine, for that matter). With that in mind, we have to wonder if anyone will actually miss these programs. Please, if we’re wrong let us know, but without even any anecdotal evidence that people have extensively used these things in the past, we’re having trouble seeing this move as a massive loss.